William Hill are giving away a life-changing amount of money ahead of the 2015/16 Premier League! You can win £50 million if you can predict the Premier League standings next season! Find here how to play and our predictions for the William Hill Prem Predictor competition! Furthermore, the customer(s) who is leading the competition at the Christmas period with the most accurate selections will win £100k. If there is more than one successful entry, then the prize will be shared equally between all successful entries. Punters will be limited to 250 entries each. How to play the Prem Predictor? Go to Prem Predictor page and make your choice! The competition will be open until 3pm on August 22 – two weeks after the start of the football season, so you can gauge the strengths and weaknesses of all 20 sides in the division. 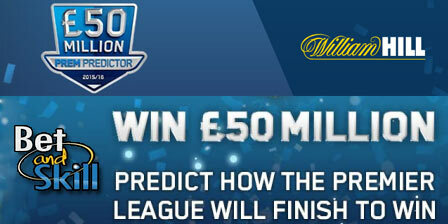 "William Hill's Prem Predictor £50 million competition: rules and predictions"